Saban Films has debuted an official US trailer for the zombie horror adaptation The Girl with All the Gifts, which already opened in the UK last year. The story is about a girl, named Melanie, who is being kept at a military base that is one of the only remaining safe havens in a zombie apocalypse. When the base it overtaken, she goes on the run with a few other people, attempting to survive in a hostile world. The movie stars Sennia Nanua as Melanie, along with Gemma Arterton, Glenn Close and Paddy Considine. I saw this film at a genre festival in Berlin last year and really enjoyed it, one of the most refreshingly original updates to the zombie genre I've seen in a while. I highly recommend it, for the performances alone. This US trailer contains some spoilers and crops the footage, but the UK trailer is still available to watch. Have fun. You can still see the other UK version of the trailer for The Girl with All the Gifts here, for a different take. A scientist and a teacher living in a dystopian future embark on a journey of survival with a special young girl named Melanie. At an army base in rural England, children being studied attend school lessons daily, guarded by the ever watchful Sergeant Parks. But one little girl, Melanie, stands out from the rest. Melanie is special. She excels in the classroom, is inquisitive, imaginative and loves her favourite teacher Miss Justineau. When the base falls, Melanie escapes along with Miss Justineau, Sergeant Parks and Dr. Caldwell. Against the backdrop of a blighted Britain, Melanie must discover what she is and ultimately decide both her own future and that of the human race. Directed by English filmmaker Colm McCarthy (of Outcast, "Peaky Blinders", "Sherlock", "Doctor Who"), adapted by Mike Carey from his own novel of the same name. 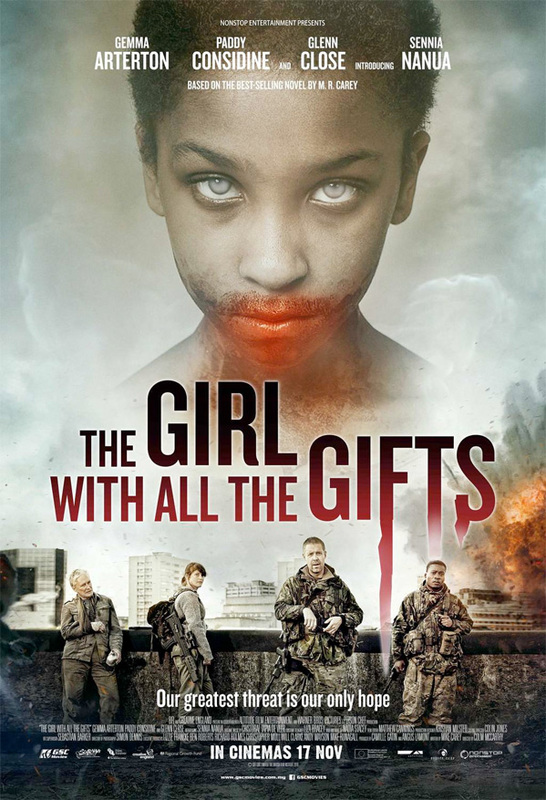 Saban Films opens The Girl with All the Gifts in US theaters starting February 24th. Anyone? For a low budget movie, I really liked it. A strange take on evolution. Looks solid. I like the 28 DAYS LATER vibes it is giving off. It's a British movie. So it should be good. If it were made by Hollywood, I would have lolled at it. I don't see the "let's copy Americans" in British productions. They are heads and shoulders (no ads here) above American productions. Those who are mimicking Americans are French and Russian productions. And the result is awful. For a stale genre that mimics it's subjects, this looks refreshing and intriguing. I'll give it a chance. I'm not normally into 'horror' or zombie flicks... but the "I Am Legend"-esque vibe, of "they're more than they appear" is most interesting. And should give great fodder to my GM, who's been wanting to run a Dead Reign game for a while. I watched this last night and loved it. It really sits with you. And the girl who plays Melanie is amazing. I hope casting directors are all after her.